Roger Federer insists he is not worried by the prospect of being overtaken by Novak Djokovic in the world rankings. Federer lies second, but Djokovic closed the gap to only 10 points with victory at the Masters Cup. "I'm going to sleep well for a month. 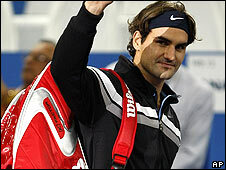 He is not going to pass me anytime soon," said Federer, 27. "For me, honestly, ranking two, three, four, five, 25, it doesn't really matter a whole lot. It is either number one or being in the main draw." Federer lost his world number one ranking to Rafael Nadal in August, and now finds himself in a precarious position in second following Djokovic's triumph at the end-of-season Masters Cup. The Serb, who has set his sights on becoming world number one, will lose ranking points if he fails to defend his Australian Open title in January - but Federer has semi-final points to protect. Federer, though, says regaining his Wimbledon title is more important to him than both his ranking and beating Pete Sampras's record of 14 Grand Slam titles. The 27-year-old, who is one shy of Sampras's mark, lost to Nadal in the 2008 final, ending his five-year reign at the All England Club. "While I would love to beat Pete's record, and also to regain my number one ranking, I place winning another Wimbledon title above all else," he said. And Federer insisted he has no plans to retire in the near future, and is looking forward to the improved schedule in 2009. "Retirement is not going to happen anytime soon because I want to play for many years to come," he said. "It is going to be interesting because I think next year will be a much better scheduling year for everybody. "This year the travel was pretty gruelling and I think next year is going to be better so I'm looking forward to that." Federer ended a disappointing season by going out in the group stage of the Masters Cup with defeat by Andy Murray. That was his 15th loss of the year, having suffered less than 10 in each of the previous four seasons. His performances at the Masters Cup in Shanghai were hampered by a back injury, but he has travelled to Malaysia to take part in an exhibition event with James Blake, John McEnroe and Bjorn Borg. Roger v Rafa - the best final ever?